For decades sugarcane was a darling of farmers. The crop can endure weather vagaries and gives fixed returns because it is procured by sugar mills at prices fixed by the government. It is not sold in the open market. The situation, however, has changed in recent years. Thanks to a new seed variety, CO-0238, the country has witnessed bumper harvests in the last three seasons, particularly in 2017-18. But sugar prices have fallen because of the demand-supply mis-match and sugarcane farmers have been incurring heavy losses. The variety was introduced in 2012 in Uttar Pradesh, which produces nearly half of India’s sugarcane. Down To Earth (DTE) travelled to Muzaffarnagar, Baghpat, Shamli, Bareilly, Sambhal, and Hardoi districts in Uttar Pradesh and found that almost every farmer was cultivating this variety. Take the case of Ashok Kumar, a farmer of Baghpat’s Malakhpur village. He started using the seed in 2017 and saw a 25 per cent rise in the yield in the very first year. In 2015-16, the new variety was sown in a little over 0.4 million hectare (ha) in Uttar Pradesh and by 2017-18 the acreage increased threefold, to 1.21 million ha, as per Lucknow-based Indian Institute of Sugarcane Research (IISR). Not only does the seed have a higher yield, the recovery percentage of sugar from it is also higher than the other varieties. Sugarcane production, consequently, saw quantum jump. According to the Uttar Pradesh Cane Development and Sugar Industry Department, sugarcane production in the state increased from 148.7 million tonnes in 2016-17 to 182.1 million tonnes in 2017-18. 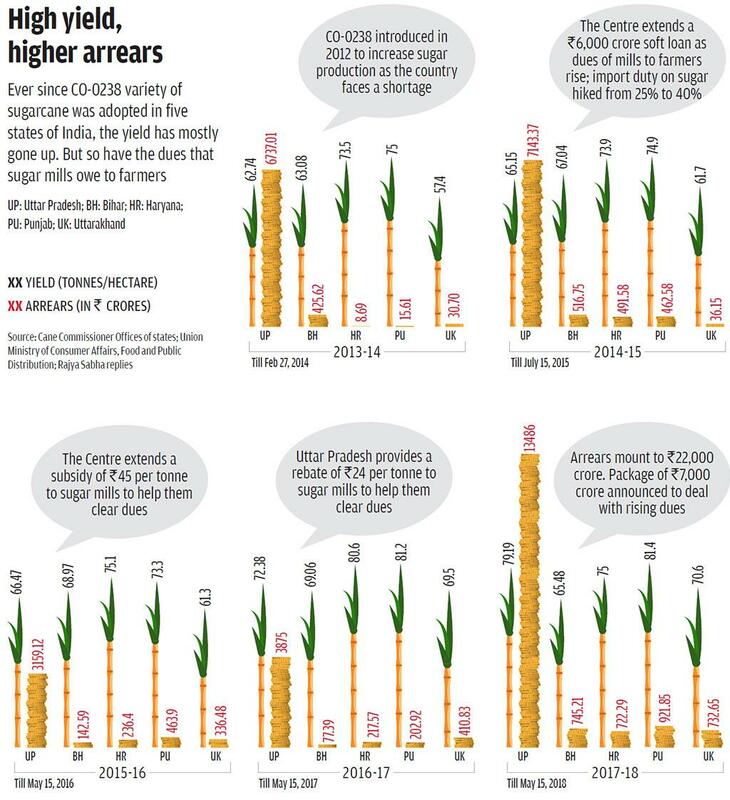 The sugar production by mills also went up across the country, due to which the sugar prices plummeted so much that the sugar mills in India cumulatively owe Rs 22,000 crore to farmers for cane supplied in 2017-18. Was a seed that was supposed to be a boon turn out to be a bane? “Don’t blame the scientists,” says Bakshi Ram, director of Coimbatore-based Sugarcane Breeding Institute. Ram is credited for introducing this variety in 2011. “A scientist’s job is to produce a good product. If governments cannot manage it, how is the scientist at fault,” he asks. All India Coordinated Sugarcane Research Project Coordinator, S K Shukla, working with IISR, explains Bakshi’s point. “The bumper harvest could have been a boon had we invested resources to produce ethanol,” he says. Ethanol is a biofuel extracted from sugarcane and is blended in petrol in different proportions, depending on the volume produced by the country. In December 2009, the government announced its National Policy on Biofuels, which called for blending petrol with 5 per cent ethanol. In 2015, the target was raised to 10 per cent. But this was never achieved. According to a reply given by the Union Minister for Petroleum and Natural Gas, Dharmendra Pradhan, in the Rajya Sabha on March 28, 2018, the ethanol blending rate reached its highest in 2016, when the country-wide average was 3.3 per cent. This is minuscule. The figure in Thailand is as high as 85 per cent. The minister also said that if the 10 per cent target was achieved, it would have saved Rs 4,000 crore that India spends on importing petrol. Moreover, it would have reduced 3 million tonnes of carbon emission, says the new National Policy on Biofuels– 2018, released on May 16. “Had we blended petrol with ethanol, our mills would not have owed huge arrears to the farmers. It was a policy failure,” adds Shukla. He also cites the example of Brazil, the world’s biggest sugarcane producer. The country depends on ethanol, and not sugar, as main revenue source from sugarcane and blends 27 per cent ethanol with petrol. The worst sufferers of this mismanaged policy are sugarcane farmers. Roshan Lal, a farmer of Hardoi’s Kunwarpur Basit village, showed this reporter his wife’s earrings, which he said were the last gold items in his house, and that he was going to mortgage them later that day. 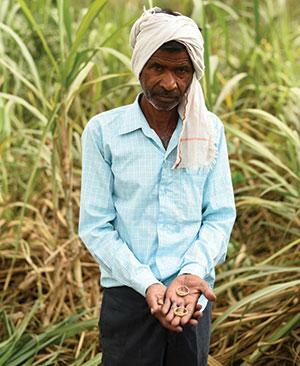 “I gave my sugarcane to Ajbapur mill this year and they owe me over Rs 2 lakh. I took a loan from a bank to cultivate sugarcane, which I have to repay. I also have to pay the labourers who helped me harvest. I have no option but to mortgage the earrings,” he says. Every season, a district-level government officer surveys the sugarcane produced and, depending upon the number and capacity of sugar mills in the area, gives a “supply ticket” to every farmer denoting the name of the mill and the quantity of sugarcane the farmer is supposed to supply to the mill. After the crushing season is over, the mill is supposed to transfer the money to farmers’ bank accounts within 14 days, failing which it should pay 15 per cent interest annually on the amount, says the Union government’s Sugarcane Control Order of 1966. But mills rarely pay on time. In Uttar Pradesh, for instance, the arrears for 2017-18 is Rs 13,486 crore, as per the Union Ministry of Consumer affairs, Food and Public Distribution. According to the Uttar Pradesh Cane Development and Sugar Industry Department, sugar mill owners in the state owe more than Rs 23,270 crore to farmers for 2012-13 to 2016-17. What’s worse, state governments are allowed to waive off the interest on delayed payment, which they always do. For instance, Ram Kumar, a farmer of Muzaffarnagar’s Baroda village says that he received his dues for 2016-17 one year later without interest. Uttar Pradesh is followed by Maharasthra in the list of defaulting mills, which owe farmers over Rs 1,908 crore for 2017-18 (see ‘Different state, same concerns’). Mill owners contend that arrears mounted because the sugar prices in the market crashed from Rs 37 per kg in 2017 to Rs 26 per kg in 2018. Farmers, however, do not buy this explanation. “If the price was up last year, why did I receive payment for 2016-17 a year later in 2018,” asks Shishupal Singh of Malakhpur. Malakhpur has the ignominy of being the village where mills have not cleared over 92 per cent of payments for 2017-18 till May 12. V M Singh, convener of Rashtriya Kisan Mazdor Sanghatan, also denies that the mills are incurring losses. In 2014, he filed a public interest petition in the Allahabad High Court demanding that the sugarcane farmers of Uttar Pradesh be paid their arrears with interest from 2012-13 to 2014-15. In its judgement on March 9, 2017, the court agreed to the demand and asked the state government to ensure compliance within four months. The government did not and is now facing contempt of court. The farmers’ crisis has been aggravated by other factors too. In October 2016, Uttar Pradesh announced the average sugarcane yield estimates for every district for 2017-18. These estimates are the basis on which the mills buy sugarcane. Farmers say that these estimates have turned out to be much less than the actual yield. Ammar Zaidi, a farmer of Hardoi district’s Pihani village, says, “The government has declared that the average yield in Hardoi is 755 quintal/hectare (1 quintal equals 0.1 tonne) whereas I produced 1,200 quintal per hectare. Since I cannot sell it to mills or in the open market,what will I do with it.” In such cases, farmers illegally sell it to those who have “supply tickets”. “This will lead to black-marketing of sugarcane,” says Zaidi. Farmers also told DTE that there are many cases where they did not get a “supply ticket” despite having a standing crop. “We organised several protests demanding remuneration, but got only assurances,” says Kishan Pratap, a farmer of Baroda village. During one such protest in Baghpat, a farmer died of cardiac arrest on May 27. Ram Kumar of Baroda says farmers from his village have held protests every month at block-level offices and even at the office of the district magistrate since December 2017. 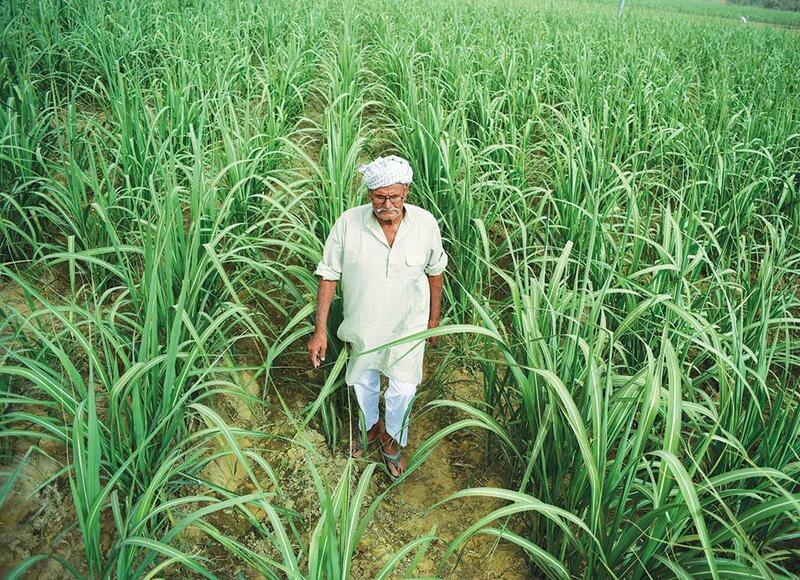 To tackle the crisis, the Central government announced a Rs 7,000 crore relief package for sugarcane farmers on June 6. The package has three components: the mills can take loans from banks (cumulatively not more than Rs 4,000 crore) to boost their ethanol production capacity; Rs 1,332 crore to be used for interest subvention on the loan taken; and, Rs 1,175 crore to create a 3 million tonne buffer stock of sugar. “The Rs 4,000 crore is just a misnomer. We are basically being asked to take a loan, which we will have to repay. The interest rate is 12 per cent per annum. The government has said it will offer interest subvention over five years, but how will it work out for individual mills is unclear,” says Abhinash Verma, director general of India Sugar Mills Association. The industry has welcomed the creation of buffer stock, but experts have also raised doubts about how it will be implemented. “There is no clarity on how much will the government buy from which mill, or where it will be stored,” says Abhijit Sen, member of the erstwhile Planning Commission. The government press release, dated June 6, in which the package was announced says that reimbursements under the scheme would be made on a quarterly basis and will be directly transferred into farmers’ accounts. But details of how this would be done are unclear. Sugar mills are also not enthusiastic about increasing the production of ethanol till its selling price is increased. “Ethanol is bought by petroleum companies at Rs 40.85 per litre and the rate is decided by the Central government,” says Verma. In India, ethanol is made from molasses, a by-product released in the sugar-making process. It can also be made from cane juice, but the production cost will increase. “The government has not allowed production of ethanol from cane juice. Till the mills are producing ethanol from molasses, the current selling rate is okay. But producing it from cane juice is unviable till ethanol prices are raised by 25 per cent,” Verma adds. A joint study by the University of Petroleum and Energy Studies, Dehradun; Centre for Study of Science, Technology and Policy, Bengaluru; and, Policy, Law and Regulation Chambers, New Delhi, published in December 2016, says that two states—Uttar Pradesh and Bihar—impose an export duty of Rs 0.50 per litre on ethanol, while 11 states impose import duties ranging from Rs 0.25-3 per litre. “Additionally, there is an 18 per cent GST and transportation cost, which will mean that the mill owners will barely make a profit,” says Verma. Another key ingredient of the relief package is fixation of minimum selling price of sugar at Rs 29 per kg to arrest the fall in prices. But the sugar mills are not happy with this either. “This is too less. The ex-mill sugar price, taking into the current fair and remunerative price (FRP) of sugarcane of Rs 290 per quintal, as decided by the Centre, works out to around Rs 35 per kg. To sell it at Rs 29 per kg will be a big loss,” says Verma. Fixation of FRP is another bone of contention between the Centre and sugar mills. The Centre decides FRP annually and the states can hike it by issuing a state advisory price or SAP. But mills want the price of sugarcane to be linked to the price of sugar. 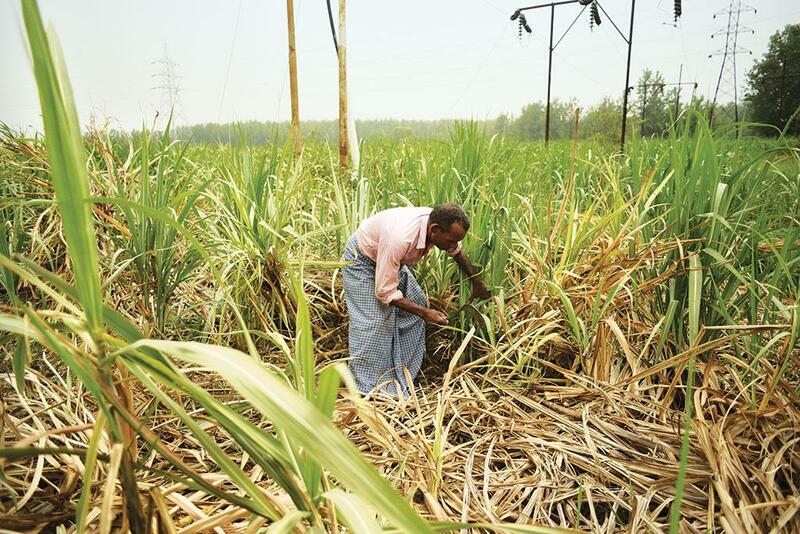 “We should be allowed to sell the sugar first and then we can decide the price to be paid to cane farmers on the basis of our profits,” says an official associated with a mill in Sambhal, requesting anonymity. “The so-called package is another symbolic message,” says Sen. “There are some good years and some bad years in cane production. So sharp planning is needed to balance the two. We have to diversify crops and ensure that sugarcane production falls. This requires long-term investment, and the government will have to encourage farmers to cultivate crops like pulses and oilseeds,” he adds. Maharashtra has had cooperative sugar mills since the 1950s. The interesting feature of these cooperatives is that they harvest the crop, says Suresh Jawade, a cane farmer from Kharnadwadi village in Sangli district. But sugar price crash has impacted the farmers here too. In November 2017, the price was Rs 3,000 per tonne, but months later it became Rs 2,500, says Amol Patil, a cane farmer from Sangli district. The problem is overflow of sugar. According to Sandeep Gidde, national core committee member of Rashtriya Kisan Mahasangh, the sugar production this year was 60 per cent more than the consumption. The government says that it will buy sugar from the mills, but where will this sugar go? Even the international rate of sugar is lower than the domestic one.